The dropping of the atomic bombs on Hiroshima (August 6, 1945) and Nagasaki (August 9, 1945) remains among the most controversial events in modern history. On July 24, 1945 President Harry Truman made the order from Potsdam to send the bomb to the Pacific theater. On July 26, it was in Tinian and a day later the Japanese were given the Potsdam ultimatum: either "unconditional surrender" or "utter devastation." On July 31, Truman gave the order to drop the bomb on Hiroshima as soon as the weather cleared after August 2. The decision was made by the White House with little input from the military. It seemed like a forgone conclusion it would be used. Discussions were more on the effect of its use rather than whether to use it or not. At the time the decision was made to drop the atomic bombs on Japan, the American public was tired of the war and disgusted with the Japanese for making them endure so much. About the only thing they wanted is for the war to be over as soon as possible. The possibility of a Japanese surrender seemed so unlikely it was not even seriously discussed. During a speech before Congress in 1945, president Truman received his greatest ovation when he said he said he would settle for nothing less than unconditional surrender. In a poll taken shortly before the bomb was dropped, a third of all Americans asked said they thought Japanese emperor Hirohito should be executed and 90 percent said the U.S. should press for a decisive victory. 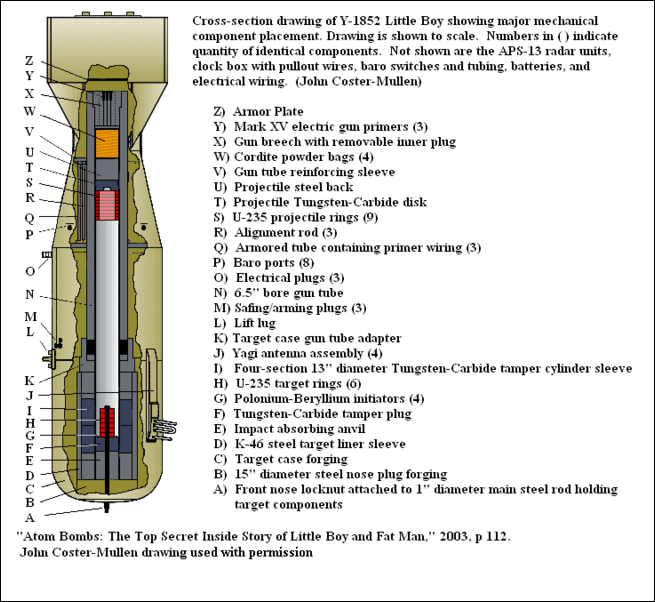 The atomic bomb was primarily designed to defeat Hitler. When the news came of Hitler’s suicide in April 1945 many scientists felt they were too late and their effort was in vain. With Germany defeated the United States and its Allies were able to focus their attention on Japan. Forced previously tied down in Europe were sent to the Pacific. After the surrender of Germany on May 8, 1945 supplies and troops bound from Europe to Japan had to travel 16,000 miles through the Panama Canal. By July, 1945, Japan was cut for its sources of raw materials and oil in Southeast Asia by Allied blockades and capture of key territory. Of Japan's remaining 4,000 aircraft only 800 were operation in mid 1945. In contrast the U.S. had 22,000 aircrafts and enough bombs and oil to keep them supplied for a long time. The U.S. military had attached mechanisms from Nazi V-1 guided missiles to American JB-2 jet-powered low altitude missiles. The Americans possessed 1,000 JB-2s by July 1945. They hoped to bombard Japan with 500 missiles a day during the planned invasion in November. U.S. intelligence through the code-breaking operation known as Magic knew that the Japanese had begun to send out peace feelers through the Japanese ambassador in Moscow. Food supplies had run dangerously low in Japan. Families scoured the forests for wild vegetables to eat. There were worries about a devastating famine. The invasion plan of Japan---code named Downfall---consisted of two phases: Operation Olympic and Operation Coronet. The objective was to force Japan into an unconditional surrender. Each operation would have been larger than the Allied invasion of Normandy. If Operation Olympic had taken place it would have been the largest amphibious landing in the history of warfare. The amphibious landing of Operation Coronet would have been almost twice the size of Operation Olympic. Despite all the hardships it suffered Japan was ready for a U.S. invasion of the main islands in August 1945. There were more than 2 million seasoned regular army troops and 28 million civilians in the People Volunteer army who were prepared to fight to the death. If there had been an invasion, the first phase of the offensive---Operation Olympic---was scheduled to begin on November 1, 1945. Under the joint command of Gen. Douglas MacArthur and Adm. Chester Nimitz, 13 divisions of the U.S. Sixth army---nearly 750,000 troops, 2,500 ships and 5,000 planes---were to attack the southern shores of Kyushu on three fronts. Their objective was to move northward and capture a third of the island and use the air and naval bases there for attacks on Honshu, Japan's largest island. In anticipation of the invasion, the Japanese had 540,000 troops and 5,000 kamikaze pilots stationed in Kyushu, ready to put up enough of a fight to force Washington into accepting a negotiated settlement. Allied intelligence estimated that there were only 84,200 Japanese troops in southern Kyushu. Japanese soldiers awaiting the invasion had been instructed to strap explosives to themselves and throw themselves at U.S. tanks and fight with sharpened pieces of bamboo and shovels. Japanese schoolgirls were told to carry a carpenter's awl with them and "aim at the abdomen." One girls said she was told, "If you don't kill at least one enemy soldier, you don't deserve to die." Japanese soldiers at prisoner of war camps were given orderes to behead, stab or shoot the 100,000 or so remaining prisoners of war the moment an invasion began. The battle that followed the landing on Kyushu was expected to take 90 days. The U.S. command predicted that 20,000 American soldiers would die and 75,000 would be wounded in the engagement. According to University of Southern Mississippi historian John Ray Skates in his book "The Invasion of Japan," the U.S. was willing to do anything to secure a total victory even if it meant using poison gas. If Operation Olympic was unsuccessful in a securing a Japanese surrender, the second phases of the offensive---Operation Coronet---was slated to begin on March 1, 1946. Under Gen. Hodges and Gen. Eichekberger, about one million men, including 25 division from the U.S. First and Second Armies would land at Kujukuri Beach and Sagami Bay near Tokyo and capture the Kanto Plain, a 120 mile area that included Tokyo and Japanese industrial heartland. Most scholars believe that Operation Coronet would probably have been unnecessary. There is still a great debate about the number of people that would have died if their was an invasion. The figure most often thrown out is 500,000 (twice the total number of U.S. deaths in World War II). Notes from an important meeting about the invasion show that Gen. George C. Marshall believed there would be 63,000 American deaths, and some scholars estimate there would have been only 30,000 to 50,000 casualties after an invasion of Kyushu. Hirohito refused request by the prime minster of Japan to end the war in January, 1945, seven months before atomic bombs were dropped on Hiroshima and Nagasaki. From 1944 to 1945 he urged his generals and admirals to gain one last major military victory so that Japan could obtain an "exit strategy" that would preserve the "imperial way." During that time an additional 1.5 million Japanese were killed. In the spring of 1945, the Truman administration decoded intercepted messages that read the Emperor himself was participating in the “struggle to surrender.” As the battle raged in Okinawa, Hirohito was foolishly obsessed with trying get the then neutral Soviet Union to support a plan to get Britain and the United States to accept a negotiated surrender on Japanese terms. This was offered by Hirohito biographer Theodore Bix as proof that Hirohito was more than a passive bystander in World War II and that he was willing to oppose his advisors and that his judgment was questionable. Numerous factors played a part in the decision to drop the atomic bomb on Hiroshima, including war weariness, domestic politics, geo-strategic politics, morality, body counts, and fear. There was relatively little debate over the decision to deploy the atomic bomb. The most overriding factor was ending the war as quickly as possible with as few American casualties as possible. High-ranking military and government personnel argued about whether or not to use the bomb. Secretary of War Stimson said that dropping the bomb would save 100,000 American lives and that detonating it by surprise on a "combined military and residential target would produce maximum psychological shock." A discussion on "Was the atomic bomb really necessary?" in a Japanese textbook "Junior High Social Studies" says that "President Truman said that use of the atomic bomb saved the lives of tens of millions of American and allied troops. An English scientists claimed that the dropping of the atomic bomb sacrificed...the citizens of Hiroshima and Nagasaki as pawns in postwar strategy toward the Soviet Union. Another theory holds that the bomb was dropped in order to justify...the $2 billion spent on making the bomb." Other military options included a blockade, firebombing, an invasion, Emperor guarantee and a Soviet declaration of war. A combination of these tactics would probably have forced a Japanese surrender, but there is no saying how long it would have taken or how many more would have died. A ground invasion of the mainland was scheduled for November, 1945.There is still a great debate about the number of people that would have died if their was an invasion. The figure most often thrown out is 500,000 (twice the total number of U.S. deaths in World War II). Notes from an important meeting about the invasion show that Gen. George C. Marshall believed there would be 63,000 American deaths, and some scholars estimate there would have been only 30,000 to 50,000 casualties after an invasion of Kyushu. One former Japanese soldier told the Washington Post in 1994, "If the Americans didn't drop the bomb, the Japanese people would never have surrendered. It's better that the Americans used the bomb, or the fighting would have gone on longer and more people would have died." One survivor at Okinawa told the Washington Post that "invasion was not just a hypothetical threat...It was genuinely in the train, as I know because I was to be in it." the bomb meant "we were going to live, we were going to grow up to adulthood after all." Some scholars insist that it was the United States’ desire for an “unconditional surrender” that prolonged the war not the refusal of the Japanese give up. The mayor of Hiroshima, Takashi Hiraoka told the New York Times: "your country sometimes says that hundreds of thousands of American soldiers were saved by the bombing but I think most of us believe the U.S. wanted to drop the bomb as quickly as possible," in part to establish it predominance in the postwar world. Critics of the bombing of Hiroshima argue that Japan was on the verge of surrender before the atomic bomb was dropped. Tokyo had begun sending out peace feelers and the country was on the verge of a famine. A strategic bombing survey by the War Department concluded that Japan would have surrendered before November 1 if the bomb had not been used. 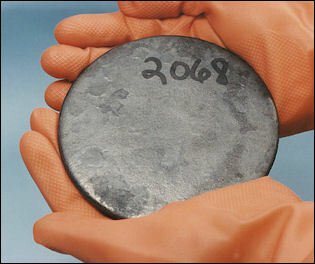 highly enriched uranium Some historians believe Truman could have ended the war without atomic bomb especially if he had waited for the Soviet Union to enter the fight. Some have even argued he "preferred" the atomic bomb because he was worried about Soviet expansion in Asia. Some people argue that the atomic bomb was dropped on Hiroshima, not to end the war with Japan but rather to give a warning to the Soviet Union and make them "more manageable" as one of Truman's aids put it. Other scholars ask "Would the bomb have been dropped on Germany, arguing Americans were more "reluctant to drop the bomb on 'white people' than Asians." One writer called Hiroshima the "the world's largest guinea pig." The citizen of the city had no warning of what was going other than a half-million leaflets, dropped two days before the explosion, which read, "Your city will be obliterated unless your Government surrenders.” Physicist Arthur Compton favored the idea of a demonstration bombing to "warn" and "impress" the Japanese before actually using the bomb. Oppenheimer opposed the idea of a demonstration, arguing that for the weapon to have its desired effect it had to be dropped on a city. “It must be stressed that if one takes a pessimistic point of view and discounts the possibilities of an effective international control of nuclear weapons, then the advisability of an early use of nuclear bombs against Japan becomes even more doubtful—quite independently of any humanitarian considerations. If no international agreement is concluded immediately after the first demonstration, this will mean a flying start of an unlimited armaments race. If this race is inevitable, we have all reason to delay its beginning as long as possible in order to increase our head start still further. 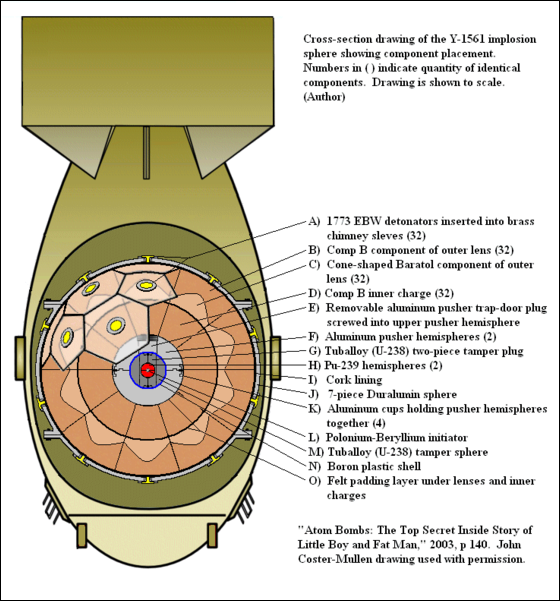 … The benefit to the nation, and the saving of American lives in the future, achieved by renouncing an early demonstration of nuclear bombs and letting the other nations come into the race only reluctantly, on the basis of guess work and without definite knowledge that the “thing does work,” may far outweigh the advantages to be gained by the immediate use of the first and comparatively inefficient bombs in the war against Japan. Was the Use of the Atomic Bomb Inhuman? Did the Atomic Bomb Bring about the End of the War? Text Sources: Harper's magazine, Atlantic Monthly Asia for Educators Columbia University, Primary Sources with DBQs, afe.easia.columbia.edu Many sources are cited at the end of the facts for which they are used.